Latest post Wed, Mar 13 2019 3:48 PM by Marianna. 124 replies. AND MINE FROM 2 YEARS AGO ! "Same problem, MC 8.3 user, but with a Blackmagic BOB. Disabling hardware immediately improves MC's performance. (I've experienced the same.) The final poster says he had to use a specific version of the driver to avoid these problems." 1. I have a capable Mac Pro with plenty of RAM and a large fast SSD for my boot drive. 2. I have a three-way, striped, media drive capable of handling plenty of sustained throughput. 3. I'm running a version of OS X (Mavericks) qualified for MC 8. 4. I've tried the official Matrox driver 4.2.0.006 and they've supplied me w/ some pre-Yosemite builds. Advice: Possible problems... The Matrox host PCI card is in the wrong slot? The Matrox host card is failing. The mxo2mini itself is failing. 1. Apple says Matrox card should go into SLOT 4 http://resources.avid.com/SupportFiles/attach/Mac%20Pro%20Intel%20Westmere%20slot%20guide%20Rev%20B.pdf BUT slots 3 & 4 are the same. Avid is making these recommendations with the idea of having you install a Unity or 10GigE adapter (Slot 1, per the guide) then connecting to some shared or legacy storage (Slot 2, per the guide). Since I'm using local storage, I can use 3 or 4. END of DAY REPORT After removing the following file from Avid Package contents last night. I have had NO TIME OUT ERRORS TODAY. First time in ages. Could that have been it all along? All of this because of that file? O M G ! Tomas, Refering to your suggestion that I had 2 Matrox Plugins on my System..The Open I/O plug-in code is seeing two Matrox devices. There was only one OpenIO_Matrox.acfin Application support. Matrox support came into my system and we looked everywhere you are supposed to look and only found one. ....different file completely.And that file was the problem. 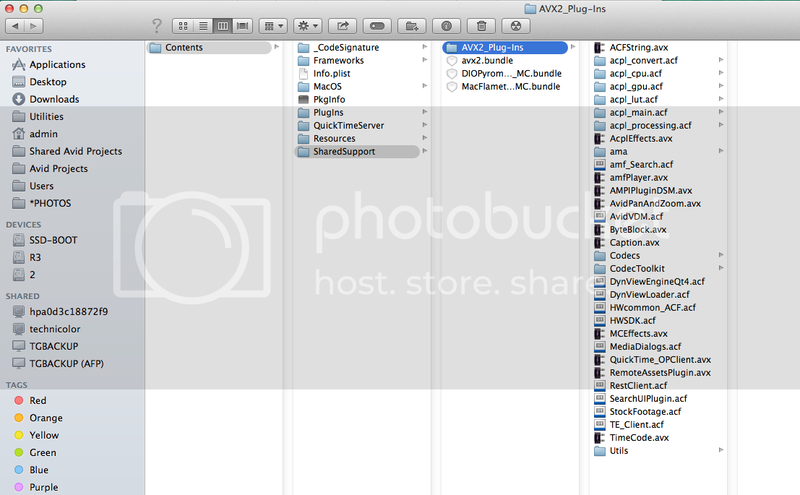 BUT What is VERY confusing is that there is 2 places on the system for these files 2 places 2 AVX2_plug-ins folders. Both places have AVX2_plug-ins folder. It wasn't till I found a forum in French suggesting that I lose the OpenIO_VirtIO.acf file in package contents to stop the Timeout that I found a solution. And strangely it was nowhere on the US/UK Avid forum that this AVID file was the problem.Just here mentioned vaguely: http://community.avid.com/forums/p/127555/730703.aspx#730703 referring to a Blackmagic issue. So I guess this is why you thought I had 2 Matrox plugins... I had an OpenIO_VirtIO.acf file in one plugin folder and an OpenIO_Matrox.acf file in another. God what a palava.. trying tolocate this llittle devil file . . .! Why is it there? If it causes so many problems for Matrox users ? And blackmagic users? It seems like you've solved your problem by removing that file which is good. The bandwidth issue that Tomas was referring to is not really a question of how powerful your computer is. Think of it like this - each one of those cards you put into your Mac must communicate with other controllers usually via the CPU. They do this in a PCIe world via lanes. The more lanes on a highway the more cars you can fit without it clogging up. Similarly the more lanes on a PCIe bus the more data you can stream without running into bottlenecks. This is further complicated because some cards and drivers generate things called interrupts. I these clash they can cause timeouts etc. The bottom line is if you are experiencing problems then you must simplify your system to the minimum spec and then add things in afterwards - it is the only way to properly fault test. I wouldn't give up on the MXO just yet. As you say, you're not seeing a lot of problems on the forum with it not working. The are multiple threads of folks having issues with Matrox devices, including one really long thread. Wow thanks for that insight Robert. Very helpful. FYI I was referring to Tracy's specific issue and trying to encourage some perserverance to get to the real problem. The SFPlayConsumer timeout error occurs across multiple devices and just about all IOs. Not just the Matrox. NO TIMEOUT ERROR FOR 3 days. I am finally able to work without restarting my computer 10 times a day. So removing that package contents file: OpenIO_VirtIO.acf did the trick. Months of SFPlayConsumer::Execute TIMEOUT error. This was an Avid software file....not 3rd party software. So why does this file exist? And why was it causing such a huge problem? From what Tomas said, I understood the issue to be - the Avid was seeing 2 Matrox drivers on the system and this was causing the error and hang/crash. NO TIMEOUT ERROR FOR 3 days. I am finally able to work without restarting my computer 10 times a day. Yay! I didnt have to remove my USB3 or e-Sata ports or change the slots, or buy a new Matrox box, or a new video card. Creating a internal 3TB RAID made the project run faster/better but this fix did nothing to stop the error. Simply removing that package contents file: OpenIO_VirtIO.acf ... this did the trick. Months of SFPlayConsumer::Execute TIMEOUT error. This was an Avid software file, not 3rd party software. From what you said, I understood the issue to be - the Avid was seeing 2 Matrox drivers on the system and this was causing the error and hang/crash. Is that correct Tomas? Nice knowledge Tracy and these forums rocks as always, lots of users contributing in this, what seems to be, a happy end. Also nice knowledge for the techs, I´ve seen that you have kept them updated so they are surely following this thread. Thanks Thomas :) I certainly will update this post if it comes back. Isnt it crazy though? That I found the solution to the problem here? Happy editing to you as well..
And the translation also mentions this.. The English speaking forums state a problem on MC version 7.0.4 with external cameras and the solution is to remove the file "OpenIO_VirtIO.acf"
Whats interesting is that My Mac hardware report sees Matrox box as a camera! How odd is that? "You may experience hangs or errors entering trim mode with Media Composer 7.0.4 and 3rd party IO hardware.Engineering is investigating the cause of this issue.Workaround: Temporarily remove the OpenIO Virtualization Plugin from the AVX2_Plug-ins folder." So this is a problem that Avid is aware of. I just wish this information was easier to find! "As a result, you will lose some of the performance and responsiveness improvements introduced in Media Composer 7.0.4, but the IO will be fully-functional"
Have you noticed any performance issues so far? Well the absense of that horrible timeout error.. is a definite performance improvement! And thats what I was used to so... its a hard question to answer since this plagued my system going back to when I first installed version MCv7. So I never experienced the improvements because I never didnt have that horrid error... until now. Because in Mavericks it difficult to move files to the desktop (it creates an alias), you can delete it from pakcage contents into the trash, then drag it from there to your desktop. See what happens.. for me the error stopped right away. But you can always just put it back. But I did a clean install of this new Matrox installer that Wayne from Matrox sent to me as well. I can email it to if you like? I use myairbridge for large files.. Thanks so much for the kind offer re the Matrox driver. I'm on Yosemite, so I'm running the new 4.5 build that Matrox just posted, so I should be good to go! I think I'll give the 'fix' a try, and as you pointed out, I can always just put it back if there's any issues. Here's to a proper fix to this issue! That knowledge base article was dated May, 2104 so I'd be tempted to say "not good enough Avid". 10 months later, 3 releases later and they still haven't addressed the problem.. perhaps MM needs to step in and give engineering a polite reminder. YES MM! I have emailed her all of the forum discussions. Its crazy that the Avid forum and Avid Knowledge base have been discussing this file for so long!